When I was 27, I embedded with the Colombian military to infil­trate the jungle stronghold of a guerrilla rebel group. 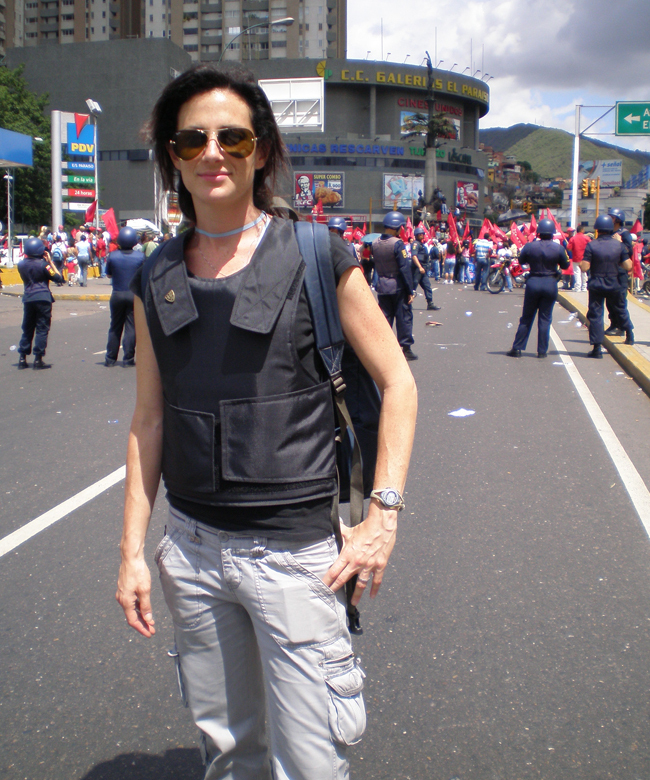 At 28, I was caught in a midnight gun battle in Caracas between police and protestors when the Venezuelan government decided to shut down the nation’s last free broadcast news station. At 29, I went along for a series of drug raids with the Federales in Mexico. I was five months pregnant. But I can’t turn my horse left. I cannot get around a course without going either too fast, causing rails, or too slow, incurring time faults. 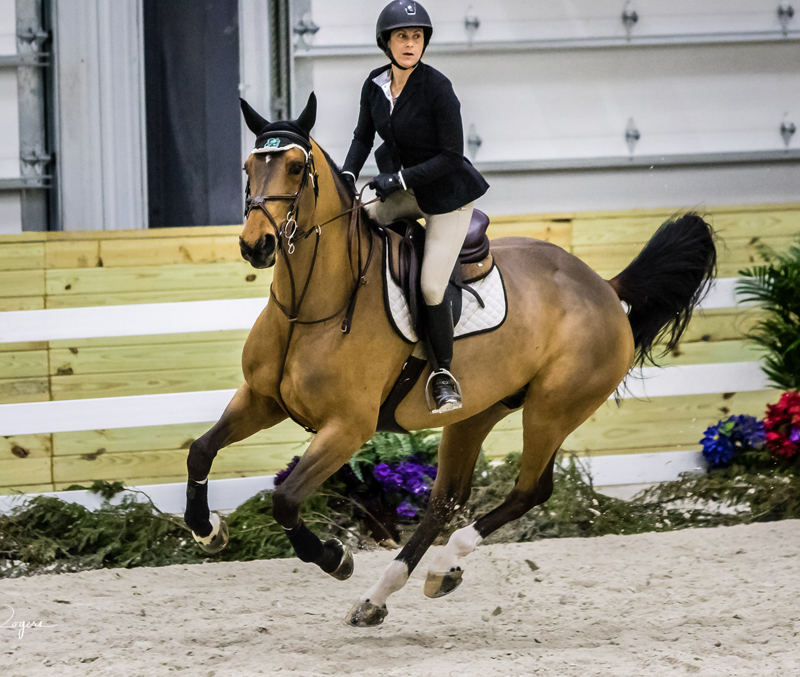 And I certainly can’t get through a whole show without enduring an embarrassing buck-fest from my 6-year-old warmblood simply because I had the audacity to put my right leg on … appar­ently the wrong way. “At 29, I went along for a series of drug raids with the Federales in Mexico. I was five months pregnant. But I can’t turn my horse left.” Photo by www.3rdshutter.com. In my career as a broadcast journalist-turned-network-executive, I have been tasked with telling important stories, resulting in some extraordinary—and extraordinarily dangerous—experi­ences. And I’ve survived them. For better or worse, my many adventures have fostered in me a certain sense of invincibility. I had success early on in the puddle-jumpers. I moved up quickly and enjoyed more success in the low adults. With my “I have a flak jacket that hangs next to a pencil skirt in my closet” atti­tude, I was thrilled when my trainer moved me up to the high adults. So off we went, my 17.1-hand 6-year-old and I, to our first show in the high adult division. It went well, and we came back with some lovely ribbons. It could only get better from here right? We started struggling. I couldn’t jump straight. Right rollbacks would lead to getting in so crooked my horse had to leap to avoid careening into a standard. I was routinely getting jumped out of the saddle. I couldn’t get enough pace to get the right strides in a line but then got so much going into a combination that I’d take down a fence. Just rail after rail. My courses started looking like a painted pole graveyard when I was through with them. Those two little holes up the standard amplified all my mistakes and bad habits, habits that I’d gotten away with at lower heights but now were ruining almost every fence. OK, I thought. Just tackle this the way you have solved other problems. Learn every­thing you can and then practice until you have gotten down to the bottom of the problem. Then FIX IT. So as with everything my whole life, I dove in headfirst. I stayed up late reading books on the American verses European jumping systems. I changed bits, bridles, nosebands. I wore shoulders-back harnesses. I wore back braces. In an attempt to fix our crookedness, I added more chiropractor sessions for my horse and started physical therapy for myself. I used more draw reins; I used less draw reins. I wore spurs; I didn’t wear spurs. I rode without stirrups. I rode without a saddle. I did cavaletti obsessively. I started running to improve my cardio, then had to quit when my back gave out. Dressage! Surely more dressage would fix this, I thought. I was already taking one lesson a week with a dres­sage trainer. Double down, I told myself. A note about my dressage trainer: She is talented, driven and rarely edits anything she says. She has her students wear earpieces so that she can constantly correct every detail of their rides for an hour and 15 minutes. No hiding at the far side of the ring, pretending you didn’t hear her. After one particularly hard week of loosening my hips and straightening my arms and relaxing my hips and checking my right rein, I had had it. I had done everything I was told to do for months, in below freezing weather, in snow, in the dark after work when I couldn’t get to the barn before 8 p.m. I had worked so hard to fix all the prob­lems to achieve my goals. “Achieve my goals.” That was the problem. I was treating my riding—the sport I had rediscovered in order to relieve stress and spend more time with my daughter—like a rung to be climbed on the corporate ladder, an exam I had to ace, a battle that I had to win. I was applying the same intensity that I had used to stay alive in the Colombian jungle to some­thing that was supposed to be just for fun. And the worst part was I had a 6-year-old horse as a hostage. You know that feeling when all of the sudden everything seems clear, and you know exactly what to do? It’s a feeling of relief and freedom. I wrote a note to my trainer and thanked her for her hard work but told her that I was taking myself down a level for a little while. I was going to stop plotting my next achievement and instead just do what I felt comfortable with. I went to see my horse and found him lying down. We didn’t work that day. We took a nap in his stall. And then the next day we took a hack. We walked a long time, and for the first time in months, I just rode without a motive. It was wonderful. So while some amateurs dream of winning the NAL championship, I dream of jumping in a straight line. While others fantasize about their first regional grand prix, I fantasize about doing a rollback in stride. I’ve spent my whole adult life planning and strategizing for the next story and the next career move. But today, I have a new plan: I’m choosing not to have one at all. Meet the Chronicle’s newest blogger, Nora Zimmett. She’s a television executive who lives in Atlanta with her incred­ibly understanding husband and her pony-crazy daughter. Her goals include finding distances with some degree of accuracy, remembering her courses, and not being jumped out of the tack. She is currently outnumbered by her animals. This article appeared in the June 18 & 25, 2018, issue of The Chronicle of the Horse.